Gift ideas for the Bride and Groom. Great for the rehearsal party or decorating party. Create your own saying if you wish to spice it up. Great for the honeymoon or as a house warming gift. Add the couples name or monogram or design. Add the couples monogram or family name to create a personal gift. 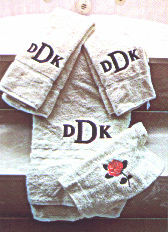 We have many colours and styles of towel sets to choose from. Please call for availability and prices.